Enjoy Berber hospitality with local interactions and home-cooked meal. 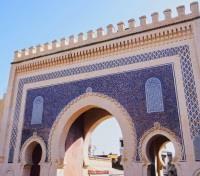 Embark on private guided tours of Casablanca, Fes, and Marrakech. Choose to 4x4, mountain bike, or horseback ride in the mountains. 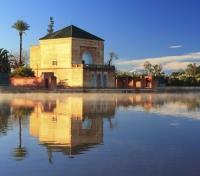 Fall under Morocco's spell on this exotic private tour of Fes, Marrakech, the High Atlas Mountains & Casablanca. 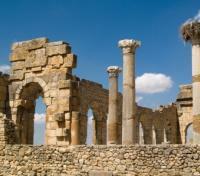 Stroll through bazaars, visit a Berber village, tour ancient harems, picnic in the mountains & more. 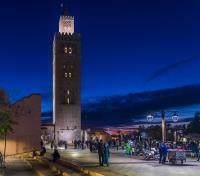 Morocco has fascinated Westerners for centuries, and its stunning landscapes and rich cultural heritage make it a perfect tailor-made destination for even the most experienced traveler. From winding narrow alleyways through bustling medinas, to the towering cliff faces of the Atlas Mountains, your customized journey will dazzle you with some of the world’s most incredible sights and sounds. You will be privately transferred between your hotel and Casablanca's international airport by an English-speaking driver. Approximate travel time varies based on the location of your accommodations, taking up to one hour. Located in the heart of the business district, opposite the Hassan II mosque, the hotel has 141 rooms and 30 suites, each of which boasts an innovative design combining comfort, modernity and luxury. The first 4 floors of this building with charismatic architecture offer guest amenities: 2 restaurants, 1 bar, a spa spanning 2 floors, 1 ballroom, 4 meeting rooms, 1 penthouse for bespoke services and a private car park. 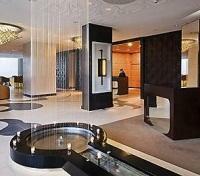 Sofitel Casablanca Tour Blanche has a steam room and a fitness facility. Wireless Internet access is complimentary in public areas. This 5-star hotel features business amenities including a business center, a meeting/conference room, and limo/town car service. Dining options at the hotel include 2 restaurants along with a bar/lounge. The staff can arrange business services, tour assistance, and secretarial services. 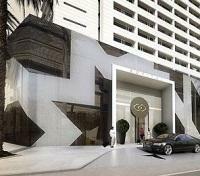 Additional amenities at this Art Deco property include spa services, a concierge desk, and multilingual staff. 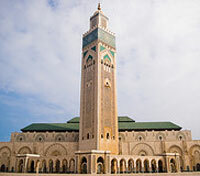 The largest city in the Maghreb, Casablanca is a bustling city, brimming with history while embracing modernity. Dense and sprawling with an eclectic miscellany of unique buildings both old and new, each corner reveals a new street with a character all its own. The city has seen an incredible amount of change through the centuries; the 1755 Lisbon earthquake all but destroyed the old city, and most of the city’s reconstruction was ordered and organized by Sultan Mohammed ben Abdallah in the mid-18th century. The King Hassan II Mosque, completed in 1993, stands out in the skyline. 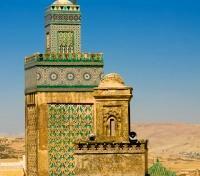 Located by the sea and featuring a 689-foot (210-meter) minaret – the world’s tallest – it’s a spectacular temple. The mosque welcomes non-Muslim guests to tour its incredible interior as part of a daily group visit which you will have the opportunity to experience. 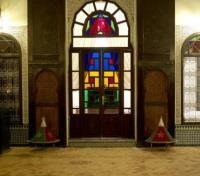 Another site of interest is the Jewish Historical Museum of Morocco, found in the Oasis area of Casablanca. Significantly, this museum – which is the only museum dedicated to Judaism in the Arab world – features a considerable range of artifacts which provide insights into both Moroccan Jewish history and Berber history, while Casablanca Cathedral (or the Church of the Sacred Heart) is another important site for many guests. Worth noting is that the cathedral is found within walking distance of the Old Medina; a relaxed and colorful, vendor-lined neighborhood that reveals the true personality of this cosmopolitan gem, thereby making it the ideal place to relax and enjoy an afternoon refreshment. When the time is right, break mid-way through the day to dine at Rick’s Café (included). Opened in 2004, this salon was designed to capture the atmosphere of the bar made famous by Humphrey Bogart and Ingrid Bergman in the 1942 classic Casablanca. With both a professional driver and a private guide at your disposal, the best of Casablanca is yours to discover. Renovated from ruins, Riad Maison Bleue, the sister property to La Maison Bleue, is an elegant hotel that successfully combines traditional Moroccan influences with modern sensibilities. The 18 suites, comfortable restaurant, private spa and hammam, well-equipped gym and intimate bar exude an air of discreet luxury. 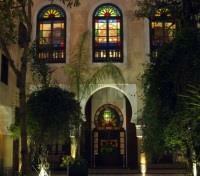 The main courtyard, with its swimming pool and lush garden is surrounded by three guest rooms and a Moorish salon. Here you will be welcomed upon arrival with a bowl of orange-blossom scented milk and almond-stuffed dates. Six of the suites overlook this courtyard, where the palm trees, mandarin trees and pool combine to create an oasis of calm. 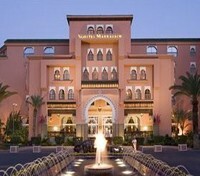 The hotel offers a choice of two ‘a la carte’ menus comprising traditional Moroccan cuisine or international dishes. There is also a room service menu available. 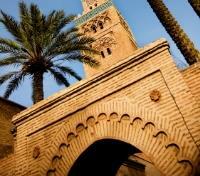 Moorish magnificence melts to French indulgence in this luxury Marrakech hotel. Set in lush fountained gardens of fragrant herbs, bougainvilleas and a palm-fringed pool, the palace is impressive in its majesty. Marble columns soar to sculpted ceilings, traditional zellige tiles and the deep reds and browns of oriental tapestries induce a sense of atmosphere. The scent of orange blossom fills the air, mingled with the sweet mint tea you are served on arrival: a taste of traditional Moroccan "marhaban." The entire Marrakech resort breathes relaxation and refinement, from outdoor sofas and loungers round the pool to sumptuous rooms and suites, some with panoramic views to the snow-capped Atlas Mountains. Woodcarvings, paintings and sculptures by Moroccan artists pose in gently curving, light interiors. A private vehicle with English speaking driver will provide a transfer between Marrakech and the High Atlas Mountain region. The approximate travel time is one hour. The walking in this region is fantastic. 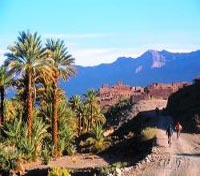 There are some fabulous walks from the Kasbah which can be tailor-made to suit your interests and fitness level (from 45 min walks to 7 hour treks with a private mountain guide). You can also choose to do 4X4 excursions, Horse or Mule Treks, Mountain Biking or choose to just relax at this fantastic property. Explore Imlil, a picturesque mountain village in the heart of the sublime Toubkal National Park just minutes from the Kasbah. Explore on your own or add some of these amazing activities through the hotel or book them in advance (activities not included in the tour price). 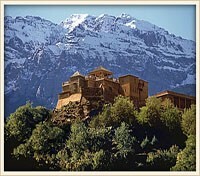 The Kasbah du Toubkal is an extraordinary venture, the product of an imaginative Berber and European partnership. 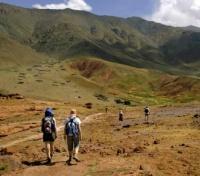 There is a shared belief that the beauty of the Toubkal National Park should be accessible to all who respect it. To this end the Kasbah has been transformed using traditional methods, from the home of a Feudal Caid into an unprecedented haven; one that provides a variety of accommodation and event possibilities to meet differing requirements. More than a simple guest house, Kasbah du Toubkal offers an extraordinary environment: the opportunity to experience the touching sincerity of Berber hospitality, in a captivating, beautiful setting. Perched in the heights of Imlil, a picturesque mountain village in the heart of the sublime Toubkal National Park, overlooking three valleys with a superb panoramic view, Kasbah du Toubkal is a dream-like refuge infused with peace and serenity. The hotel features gardens, terraces, balconies, restaurant, alcohol-free bar (guests may bring their own alcoholic drinks), underfloor heating, fans, hammam, conference room, Wi-Fi and luggage room. 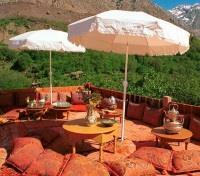 The Kasbah is truly a welcoming environment for those seeking a comfortable mountain refuge in a stunning setting. Kasbah du Toubkal is not a hotel in the traditional sense; it is more an extension of the hospitality that stems from the home of the Berbers who run it. This property was named one of National Geographic’s Most Unique Lodges in the World. Prepare for a day of exploration and cultural enrichment as you head out aboard a 4-wheel-drive vehicle into the picturesque surroundings of the High Atlas Mountains Ranges accompanied by a local expert guide. Depart in the morning from Asni to the hamlet of Imlil where the off-road adventure begins. Enjoy the view as you'll be driven along the serpentine, non-graveled roads to one of the highest perched villages of the range, some 2000 feet high. En-route, marvel at the many terrace-lined towns and small mud-brick houses. Make a stop along the way to the local old hydraulic and olive press which to this day is still in use. A visit to the Takherkhort Reserve is also scheduled where you can enjoy a walk through native flora and fauna, stopping along the way to take some photos of the Barbary sheep and the over 150 species of birdlife. Upon arrival to the Mountain Lodge you will feel the greatest sense of homeliness and comfort by the welcoming scent of freshly baked bread, as the local woman demonstrate Berber hospitality at its finest. As the ancient oven continues to bake, you will be seated on a panoramic terrace and served local delicacies and of course some of that freshly baked bread as you admire the almost surreal surroundings. From here, you will be driven to the town of Tahanoute, a picturesque village set among a variety of olive groves, and citrus trees for an opportunity to admire the red clay structures built according to traditional Berber construction techniques. A local resident will prepare a home-cooked meal for your enjoyment, with a special "table-setting" atop their roof. This opportunity allows you to experience the everyday life of these mountain people. A private vehicle with English speaking driver will provide a transfer from the High Atlas Mountain region to Casablanca. The approximate travel time is four hours.